Shark UW photographers that visit the the Bahamas have the choice between three locations with different apex predators: the Tiger shark at Tiger Beach (West Point), the Great Hammerhead at Bimini and the Oceanic white tip at Cat Island. In the right season and suitable weather conditions, one can be pretty sure of encounters with these fabulous creatures. There are two reasons why: first that the mostly female sharks tend to return to their specific habitats in certain months of the year and second that dive operators use a bait to attract them. Another obvious reason is that sharks are protected by law in the Bahamas Shark Sanctuary, making it one of the few places in the world where one can still meet healthy populations of sharks. Baiting means shaping the sharks behavior. It is not so much the amount of food, but rather the regular administration of small pieces of smelly fish. This triggers a conditioning process not so different from feeding dogs or the goldfish in your pond (keeping in mind of course that we now deal with big and potentially dangerous species). 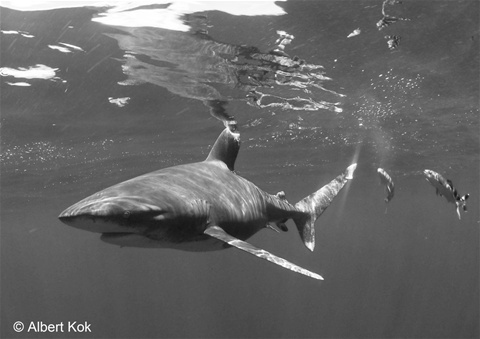 When done sensibly baiting of sharks should not interfere with their natural feeding behavior. It allows the photographer to come close to the shark, but simultaneously prevents that the shark spends too much attention to divers. The only reason why a baited shark will occasionally close in or even bump you is that it sees you as 'bait provider' not as bait. In fact any event associated with bait administration, such as the sound of the propellor of the approaching boat or a diver in a black wetsuit entering the water, will trigger its interest. Benefits of baiting So the bottom line is that baiting means more safety for the diver. For example, in the Red Sea snorkeling with the Oceanic shark is considered a 'no-no'. This is because it has the reputation of being a bold shark, that tends to come very close to or even bumps divers. At Cat Island, where the Oceanics shows up regularly in springtime their boldness is rather an advantage than a menace for UW photographers. For me it was an truly amazing experience to swim among eight Oceanics on my trip to Cat Island last week, after having spent two days with Neil Watson on Bimini with the 'great hammies'. Shooting along with my Olympus and 8 mm Panasonic with filter leaving the strobes on the boat, or with the D7200, Tokina 10-17 with strobes. An experience made possible by our two very nice and competent dive operators, Vincent and Debra Canabal. The same team also operates at the two other locations I mentioned. Athough the focus is on the Tiger, Great hammerhead and Oceanic shark, each location has also other species that mix in with the big guys: Lemon and Carribean sharks at Tiger beach, Nurse and Bull sharks at Bimini and Silky sharks at Cat isand. Offering ample opportunies to take home a variety of superb shots.